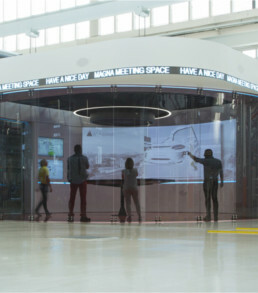 Meeting Space provides an immersive experience for the User directly on the shop floor, by combining the spatial setting with embedded high-technology and just-in-time data visualization of all processes in a factory. 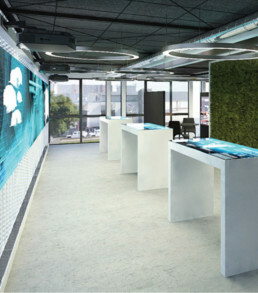 The design of the “Innovation Tower” (7 Bamboo Groves) gathers disparate programmatic, physical, and infrastructural elements from the requirements of the building and its surrounding context, and synthesizes these into a form that seamlessly integrates the building into the idiosyncrasies of its site while expressing multiple flows of movement. 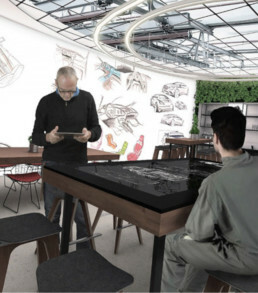 "Creativity Space" should operate as an attractor - „brainstorm of ideas“ - a place where all workers and employees have a chance to submit their ideas, propose improvements or simply try out new technologies.